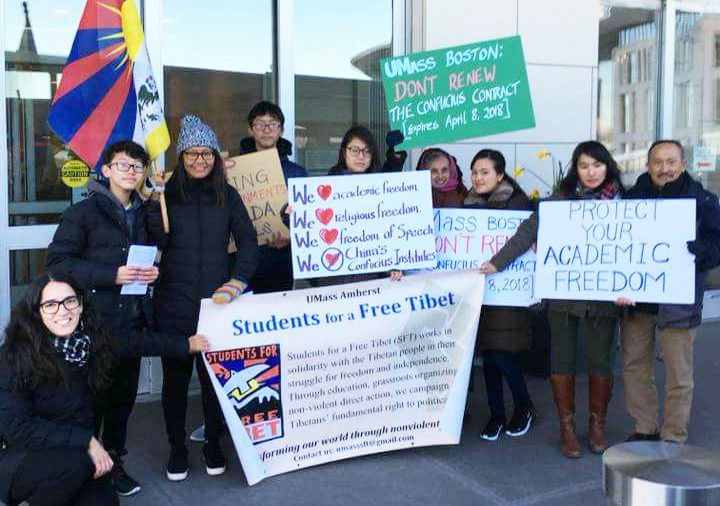 Tibetans and supporters protesting UMass Boston's potential renewal of their Confucius Institute contract. The University of Massachusetts Boston has officially severed its ties with Confucius Institutes! This victory is a testament to the power of grassroots. Just over one year ago, Boston community members, students, faculty, and activists started organizing against the CI at UMass Boston. They wrote letters to elected leaders, signed petitions against the partnership, protested at the board of trustees meeting, met with the university administration, flyered in the freezing cold – and WON! It is because of the collective efforts of the Boston community and the support from our members around the world that we are able to celebrate this victory today. At SFT, we are committed to uplifting these local organizing efforts. With your help, we can win more victories like the one in Boston. Make a gift today to support the continued success of this campaign. In the US alone more than 10 Confucius Institutes were shut down in the last year, but we still have a long way to go. With more than 100 Chinese government backed CIs operating in schools across the US (even public schools!) and more than 500 globally, we need all the help we can get to keep CCP propaganda out of school curriculums. Donate to the campaign today.